An unmanned Russian Progress supply ship blasted off from the Baikonur Cosmodrome in Kazakhstan Friday, rocketing smoothly into orbit and setting off after the International Space Station. Loaded with 2.8 tons of supplies and equipment, the Progress M-15M spacecraft lifted off at 8:50:24 a.m. EDT (GMT-4) and climbed away through a nearly cloudless sky. Eight minutes and 45 seconds later, the spacecraft slipped into orbit. "A flawless launch," said NASA mission control commentator Rob Navias in Houston. "The Progress now in its preliminary orbit, headed for the International Space Station." If all goes well, the spacecraft, loaded with 1,988 pounds of propellant, 926 pounds of water, 110 pounds of oxygen and 2,703 pounds of dry cargo, will execute an automated approach to the station complex Sunday, docking at the lower aft Pirs module around 10:39 a.m. 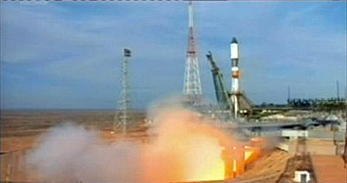 The launching kicks off a particularly busy month of space station activity. On April 27, three of the station's six crew members -- Expedition 30 commander Daniel Burbank, Anatoly Ivanishin and Anton Shkaplerov -- plan to strap into their Soyuz TMA-22 ferry craft and return to Earth, landing around 7:45 a.m. to close out a 165-day stay in space. At that point, the three remaining station crew members will form the core of the Expedition 31 crew, led by commander Oleg Kononenko, European Space Agency astronaut Andre Kuipers and NASA flight engineer Donald Petit. Three days later, on April 30, Space Exploration Technologies Corp. -- SpaceX -- plans to launch a Dragon cargo ship on the company's first space station resupply mission. After exhaustive tests to make sure the Dragon is operating properly, the spacecraft will maneuver to within about 30 feet of the space station on May 3 and await capture by the lab's robot arm. If all goes well, the Canadian-built space crane, operated by Pettit and Kuipers, will pull the Dragon capsule in for berthing at the Earth-facing port of the forward Harmony module. The station crew will focus on research and unpacking the Progress and Dragon capsules while three fresh crew members -- Gennady Padalka, Sergei Revin and NASA astronaut Joseph Acaba -- gear up for launch at 11:01 p.m. May 14 aboard the Soyuz TMA-04M ferry craft. Assuming an on-time liftoff from the Baikonur Cosmodrome, Padalka will oversee an automated approach and docking at the upper Poisk module on May 17, boosting the lab's crew back to six. Four days after the new crew members arrive, Kuipers and Pettit will use the robot arm to detach the Dragon capsule, releasing it into space for an automated re-entry and splashdown off the coast of California later that day.